Acupuncture is an extremely useful alternative treatment for dogs and cats, both young and old. Combined with Chinese herbology, Dr. Evans can treat a wide variety of diseases that may or may not respond well to Western medical approaches. After finishing her training with the International Veterinary Acupuncture Society in 2002, Dr. Evans continued her schooling in Chinese herbs with the Chi institute. 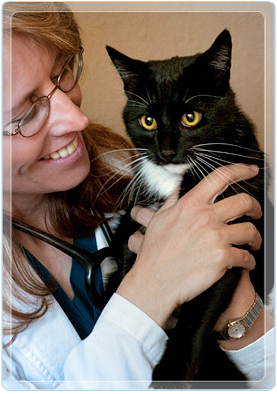 She has successfully treated pets with arthritis and musculoskeletal disease, kidney and liver diseases, skin problems, diabetes, neurologic disorders and many other ailments.